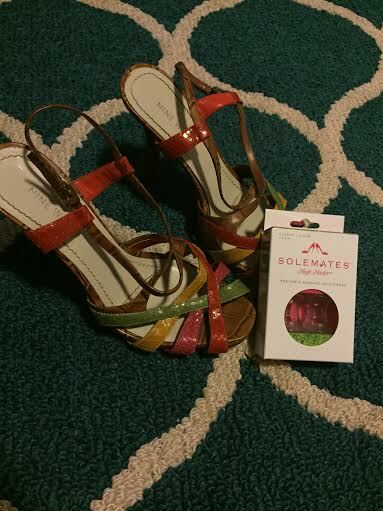 I recently had the honor of trying out some truly amazing products from the company SoleMates. 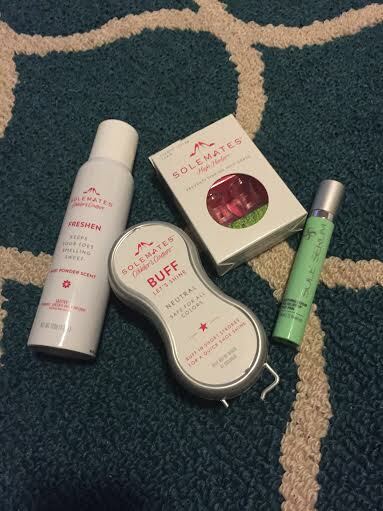 SoleMates is a great company that has a complete line of shoe care products perfect for all of your shoe needs! They recently expanded the company to include a line called Cobbler’s Couture. It is a line of shoe care specifically created for women and their shoe care needs. This is the perfect line for taking care your shoes and really helping them to stay looking their best. The first product that I tried was Buff. This is a sponge that provides a quick and easy shine for your shoes that keeps them looking brand new. It also removes scuffs! It is safe for shoes of all color and the sponge can be washed for repeated use. 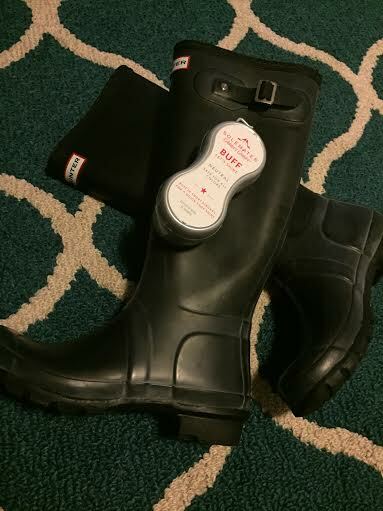 I tried it out on my Hunter Rain Boots. 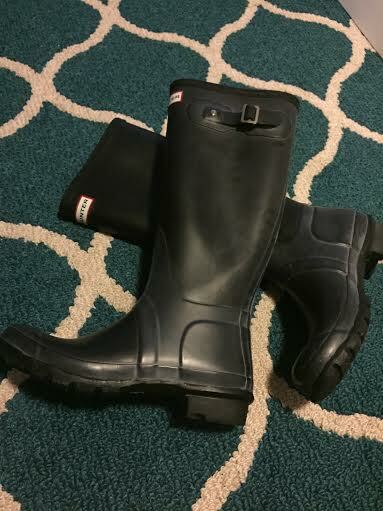 I have the classic Hunter’s and while I love them, they have a tendency to get dull and dusty looking. 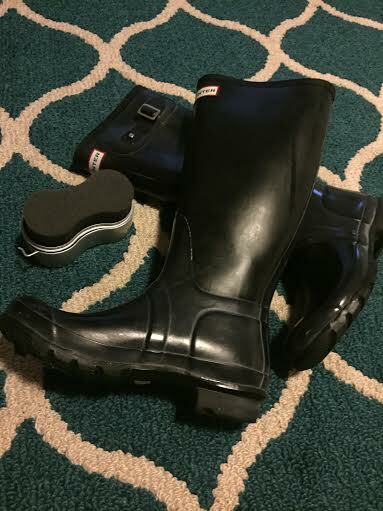 This is my boots before I used the sponge. This is my boots after I used the sponge!! I love how shiny the look and the dull, dusty appearance disappeared!! The next product that I tried was Freshen. 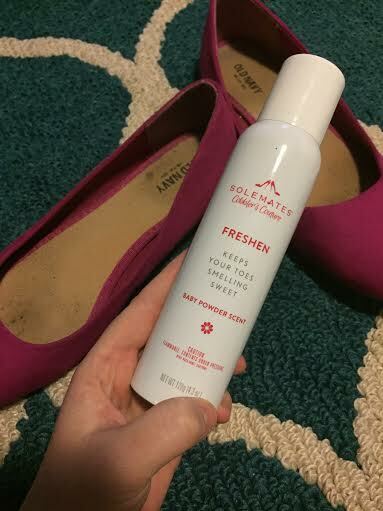 Freshen is a Baby Powder Scented spray that keep your shoes (and toes!) smelling fresh. It is made with all natural ingredients and without harsh chemicals. 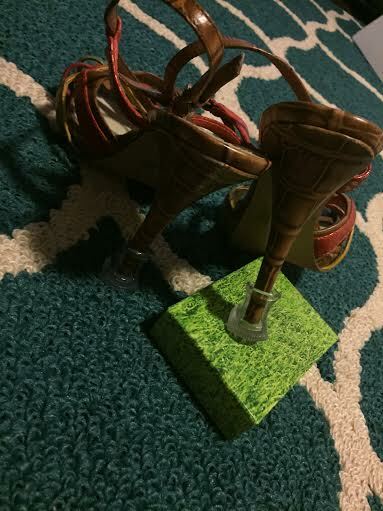 It is great for all types of shoes. 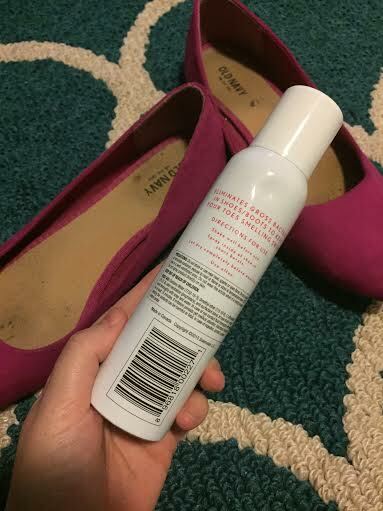 I used it on a pair of my flats with cloth insoles. I have found that these types of shoes tend to cause your feet to sweat a little more resulting in a little more stink. It happens to all of us so why not find a product to correct that?! The spray smells truly amazing, but it does more than just provide a great smell. It actually goes into your shoes, killing that odor causing bacteria and leaving your shoes and your feet smelling powdery fresh!! This will be a product that I use on a daily basis!! The next product that I received was the High Heeler. 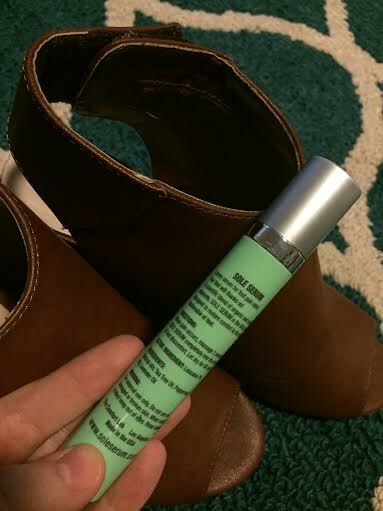 This is a product that the company is know for and is truly a life saver for walking in heels outdoors. The High Heeler prevents high heels from sinking into grass as well as protects the heels on cobblestones, brick, grates and wooden decks. It also prevents damage to antique wood floors and woven carpets. The High Heeler slides right onto the heel and stays in place. I received clear but they also come in gold, silver and black. These were perfect for my heels on Easter Sunday. We ate dinner as a big family in the backyard, watched the kids hunt eggs and just enjoyed one another’s company. 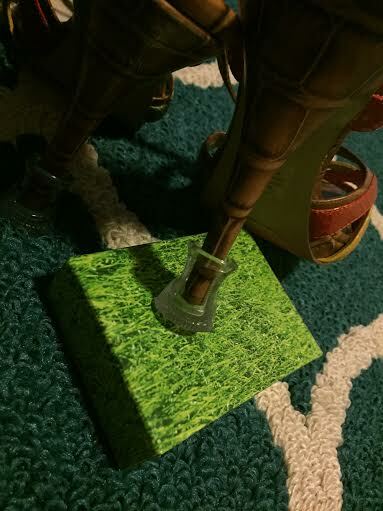 Not once did my heels slip into the grass! The High Heeler stayed in place and I stayed safe and stylish. The final product that I had the privilege of trying is Sole Serum. This is, perhaps, the Holy Grail product from the company. I did not find it on the companies page, but did, however, find it on a number of second hand sites. I linked it above so that it can be purchased through Amazon. 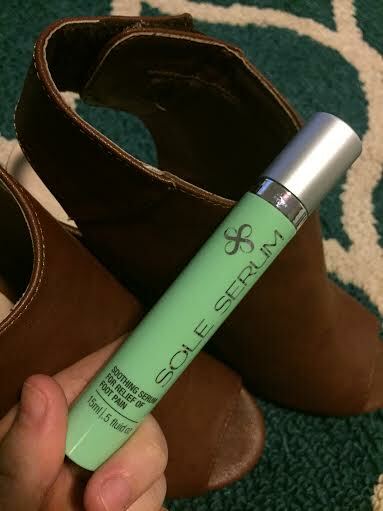 Sole Serum is a luxury serum that relives foot pain from wearing high heels or being on your feet all day. The Lidcaine in the serum not only stops the foot’s pain, but also helps to reduce inflammation. The blend of natural oils also soothes your skin. The serum starts working in just ten minutes and lasts up to 2 hours!! 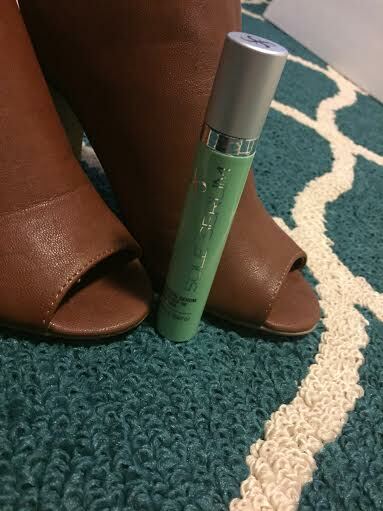 I used it with a pair of my favorite peep toe booties. While they are more comfortable than most heels, they do have a tendency to rub and pull on my feet by the end of the day. I rubbed the Sole Serum on the places on my feet where I was experiencing pain. It was literally like taking Tylenol for a headache… one minute I was experiencing pain and within just a few minutes, it was gone!! I literally carry this little bottle with me everywhere now, especially now that I am pregnant. It has truly been a lifesaver for my aching feet!! I am so thankful for the Sole Mates company and the chance to try out all of these amazing products. I have found some products that I truly love and will continue to use for all of my shoe care needs!! Be sure to check them out and order some of these amazing products for yourself! !